It’s Sydney Royal Easter Show time! This year we have sixteen Young Farming Champions trekking to Sydney for the show. Whether it’s stewarding merinos, hosting groups of glampers around the campfire, prepping prize poultry or judging show cattle, we are THERE! It’s the highlight of the agricultural show calendar and if you’d like to share the #myeastershow love with us, head on over to the Picture You in Agriculture Facebook page to keep up with our YFCs at the show. Read on for this week’s tops stories from our Young Farming Champions (YFC) across the county! If you’ve ever wondered what the life of a contract musterer looks like, Wool YFC Chloe Dutschke shared insights into her career when she guest hosted our Picture You in Agriculture Facebook page this week. Head to our Facebook page to follow more of Chloe’s adventures. It was a busy week for Chloe, coinciding with the announcement of the Peter Westblade Memorial Merino Scholarship, in which Chloe was named a 2019 Scholarship winner. Mega Congratulations Chloe! Read more about it in The Border Mail here. Wool YFCs Adele Smith, Chloe Dutschke and Dione Howard at the Peter Westblade Scholarship dinner. Youth Voices Leadership Team (YVLT) Vice-Chair Emma Ayliffe attended the Acres of Opportunity Irrigated Cotton field day in Conargo, NSW. It was an opportunity for growers to look at a new cotton development in the local area. Well done to our team of Young Farming Champions and friends of the program who helped pull off the incredible Primary Preview Day at Sydney Royal Easter Show last Thursday. Hundreds of school children engaged with activities around wool, eggs, soil and bees, hosted by our YFCs Samantha Wan, Haylee Murrell, Tim Eyes, Jasmine Whitten, Laura Bignell and Casey Onus. The biggest thanks goes to the team of brilliant “doers” who support our Young Farming Champions in these activations. All news from Sydney Royal reports the Primary Preview Day was a smashing success and we owe so much of that to the dream team who are behind us every step of the way. Thank you to everyone involved. This was also a great opportunity for friend of PYiA, the incredible Aimee Snowdon from Little Brick Pastoral catch up with Hamish McClure, one of the winners of our 2018 National Agriculture Day competition. The first Saturday on the Royal Easter Show provided the perfect opportunity for Paddock Pen Pals teacher Zoe Stephens from Carlingford West Public School and YFC Sam Wan and Dione Howard to meet face to face in the Sheep Pavilion. Emily King from Australian Wool Innovation made the most of Zoe’s visit with an interview for the Yarn podcast series. We look forward to sharing Zoe’s yarn with you shortly. Beyond Sydney Royal, Climate Action YFC Anika Molesworth has had a busy week with keynote speaking gigs to more than 1000 people at NSW and ACT Geography Teachers Association Conference, Rotary Conference and Prime Super – Unleash Your Super Power Events. Our PYiA Program Director was in the audience at the Prime Super – Unleash Your Super Power Event and said Anika had a very powerful affect on the audience with a number of people commenting that Climate Change was an important issue to them and Anika had empowered them to have meaningful conversations with friends, family and colleagues about Climate Action. Well done Anika! Wool Young Farming Champion Sam Wan and Eggs Young Farming Champion Jasmine Whitten represented PYiA at Animal Welfare Collaborative Academic Think Tank Summit in Sydney on 9th April. YVLT mentor coordinator and Wool YFC Dione Howard spoke at the District Veterinarians of NSW Conference in Newcastle this week about the complications of grazing canola in dry conditions. Around 90 delegates descended from across the state to discuss lessons learnt from drought, the key issues in NSW surveillance activities and to celebrate 101 years of public veterinary service. YVLT Chair Jo Newton joined several hundred animal scientists from around the world at the British Society of Animal Science Conference in Edinburgh. She presented some of her research in the genetics and genomics session. Jo also had the opportunity to catch up with researchers at University of Edinburgh and gave a guest seminar on the value of genetic & genomic tools. She managed to fit in some sightseeing too, including a whisky tasting in the largest private whisky collection in the world. Forbes Corby was spotted at the Sydney Royal Easter Show Ag Bag Stand, where he is spending his Easter break making sure every cent raised by the sale of the Ag Bag goes directly to the RAS Foundation Community Futures Grant program. Great work Forbes! Congrats are also due to YFC Sally Poole who will shortly commence a new role as a precision ag agronomist at Precision Cropping Technologies (PCT) in Goondiwindi. Massive shout out to YFC Alana Black who has had a piece published in The Australian Farmer. In it Alana shares her family’s experience with succession planning and has some great advice for anyone thinking about succession in farm businesses. You can read the story here. It very much feels like all roads lead to the Royal this week with many YFC involved throughout the show. Congrats to YFC Bec Thistlethwaite, who has been selected as a 2019 Rural Achiever and is currently enjoying a behind the scenes Easter Show experience. Good luck to Bec this week as we await the announcement of the RAS Rural Achiever Scholarship. YFCs Lucy Collingridge, Rebecca Thistlethwaite and Jasmine Whitten catch up at Sydney Royal Easter Show. Wool YFC and YVLT communications coordinator Bessie Thomas and her family swapped the bush for the beach earlier this month, holidaying in the beachside paradise of Port Stephens thanks to an incredible random act of kindness. Bessie and her family – who have been farming through drought for several years – were gifted the week long holiday from Alloggio/Port Stephens Accommodation business owners Will Creedon and wife Karen, former member of the NSW Legislative Council Scot MacDonald, and the Port Stephens Council. Local businesses The Little Nel cafe, Imagine Cruises, 4WD R US sandboarding adventures and Crest Birubi Beach cafe all pitched in to spoil Bessie’s family with delicious meals and amazing adventures. Read more in The Rural Weekly here. Outback Magazine and PYiA journalist Mandy McKeesick currently writing a feature story on the fishing industry took the opportunity to make PYiA HQ her base this week. Have a great week together Mandy and Lynne! Sheep breeders descend on Dubbo. Central West NSW was home to all things sheep on the week of the 18th of March. Wool Young Farming Champion (YFC) and Youth Voices Leadership Team (YVLT) Secretary, Peta Bradley was present along with a 300 plus strong crowd at the Sheep CRC Final Conference celebrating 19 years of industry collaboration, research and adoption. Following this Sheep Genetics, who Peta works for, had their Leading Breeder conference, 170 sheep breeders from 6 states plus New Zealand attended.The conference theme was “Breeding sheep for a Future Environment”. See the word cloud below from the conference under the #leadingbreeder19 tag taken from the avid sheep breeders on Twitter. Jasmine Whitten our Eggs Young farming Champion has been busy attending the Local Landcare Coordinator State Gathering in Sydney. This was an event where all the coordinators from across NSW got together for a few days of networking, sharing and learning from each other. At the event Jasmine participated in strategic planning, governance, and group facilitation workshops. She learnt a few tips and tricks which will hopefully make their way into her school presentations in this year’s Archibull Prize. On top of this Jasmine in her role as a Local Landcare Coordinator at Western Landcare worked with the Buckwaroon Landcare Group organised a schools event for year 4 students at Cobar Public School. This event was called Healthy Soils, Healthy Farms and taught students how farmers care for their soil through the use of QR codes, using a stream table and an experiment which focused on the importance of grasses in our farming systems. It was a huge success with students asking if they can do it every single week! YFC Calum Watt is kicking big goals in Western Australia as he researches better breeds of barley at Murdoch University in Perth. Calum is completing a PhD aiming to increase barley yields under future predicted temperature increases and has been nominated by his university to attend the University Scholars Leadership Symposium in Kuala Lumpur in August. We look forward to the insights from the symposium – jump over to the blog to read more about Calum’s research! The ‘field’ for many of our YFCs currently extends well beyond the paddocks of Australia – YFC Laura Phelps is currently in the United Kingdom leading the team responsible for EU-Exit for the Food Standards Agency. The Food Standards Agency makes sure that food is safe, what it says it is and that the rights of the consumer are protected. Laura has put together a guest blog for us on what she’s loving about working in the UK and the path that led her there – have a read and check out her visit to Hogwarts! YFC and YVLT Chair Jo Newton guest hosted the Picture You in Agriculture Facebook Page from Ireland which also happens to coincide with the day of the Irish – St Patricks Day! Originally Jo started her YFC experience has a Wool YFC and she got her sheep fix by heading to an Irish sheep farm for lambing. You can read more about Jo’s experiences on our Facebook Page. 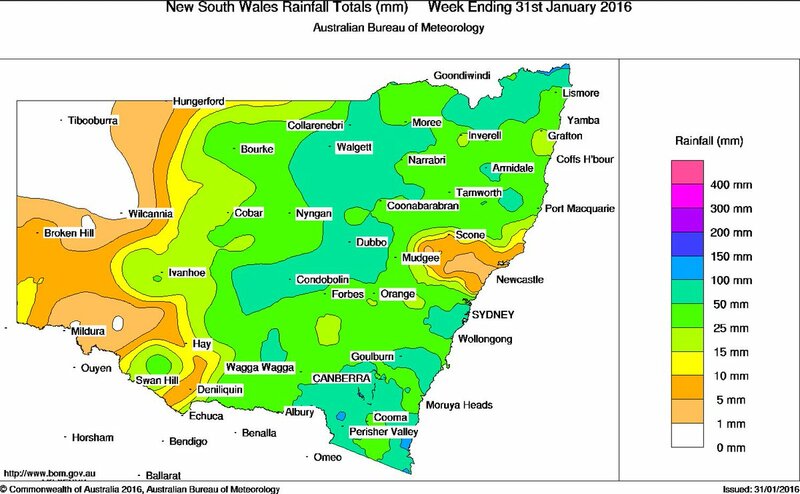 Some of the Eastern States were lucky enough to get under some much needed rain over the last fortnight with some significant rainfall reports recorded. Reports of >120mm in Central West NSW were recorded and some rivers which have not flown in 2 and a half years now have water moving downstream. Fingers crossed that this is a sign of things to come for the rest of 2019 and follow up rainfall is not too far off the horizon. See our Facebook Page to see where the rain fell! Now for an update on the launch of our Paddock Pen Pals program! Last muster we’d had the first couple of Google Hangout sessions beaming our YFCs straight into the classroom. The next wool YFCs taking the schoolroom to the paddock – or wool selling centre – were Sam Wan and Chloe Dutschke. Sam had an immediate connection with the students from Carlingford West Public School, being a city-kid herself. Chloe tuned in from the vast plains of Hay NSW which amazed the students in their classroom. Our YFCs are again gearing up for Primary School Preview Day at the Sydney Royal Easter Show, which will be held on 11th April. Students in Years 4-6 will experience the show behind the scenes and learn about Australian agriculture in a series of fun and interactive workshops. This year we are excited to be partnering with University of New England (UNE) and their Discovery Voyager team to bring five workshops to students on the day. YFC Jasmine Whitten will be talking all things eggs, YFCs Sam Wan and Haylee Murrell will be sharing the wonders of wool, YFC Casey Onus will workshop the secrets in soils and YFC Tim Eyes will bring the story of bees to students. We can’t wait to share with you some stories from the day in our next muster! Earlier this month YFC and Youth Voices Vice Chair Emma Ayliffe recapped her recent trip to Israel over on our Picture You in Agriculture Facebook page. Emma shared many insights into the 2019 ADAMA Young Agronomist Study Tour, including everything from farming systems in Israel to the nation’s rich cultural landscape. Catch up on more of Emma’s recap over at our Facebook page! Congratulations to part of the YFC family, Greg Mills, who alongside his business partner in FutureGen Education Angela Colliver, was recognised for innovation in training programs in meat processing plants across NSW. Greg and Angela have developed programs to introduce school teachers to the industry, including plant tours and processing operations such as biosecurity risks, ethical handling of animals, use of robotics and packaging. Well done Angela and Greg! This week the NSW & ACT Geography Teachers’ Association annual conference is to be held at Sydney’s ANZ stadium. Climate YFC Anika Molesworth is keynote speaker at the conference and will speak on youth in agriculture, climate and community. This year’s conference theme is “reflecting on the past, assessing the present and shaping the future” and we are proud that Anika has been chosen to share her powerful messages on this theme. Congratulations Anika! This fortnight’s top stories from Young Farming Champions around the country. Another fortnight of celebrating the amazing achievements of the young farming champs. It is an exciting time for the team, with the Archibull Prize expressions of interests for secondary schools is now open! We can’t wait to see what the schools come up with, and support them on the journey through agriculture. You can read Bessie and Peta’s stories here. The last fortnight saw the celebration of Regenerative Ag Day with a number of YFC showcasing what hey are doing with their businesses. YFC Marlee Langfield is celebrating the selection of one of her photos in the AgWomen Global Book…. stunning pic, Marlee! Egg Industry YFC Jasmine Whitten has been busy in her new role as the local landcare coordinator for Western NSW presenting to the Cobar and District Rotary club talking about her role for the LLS, her volunteering and how all this fits in with her personal values. Friend of the YFC Nicole McDonald has also had a feature piece as part of the Archibull Career Snapshot, and not with the typical agriculture job description that you might expect. Nicole took some time out to describe her role as a social science researcher and how that fits into the broad world of agriculture, going to once again show the wide diversity of career option on ag. Read Nicole’s story here. Erika Heffer ran a Foundations in Leadership course for a teamwork exercise mentoring 14 people in Masterchef style. She also made an appearance on ABC Swan Hill Radio talking about the Archiebull Prize as well as all the other wonderful projects she has been busy with. Sheep YFC Chloe Dutschke has been in NSW at Wyvern Station learning the tools of the trade for sheep. This included learning about sheep selection, stockmanship, personal development, agtech and a heap of other skills. This was thanks to the Peter Westblade Scholarship where Chloe was joined by 30 other sheep producers. Congratulations to YFCs Keiley O’Brien and Jasmine Whitten who both competed in their Showgirl zone finals this month. These two stars shone bright and you should both very proud of your tremendous efforts. Thank you to Lucy Collingridge for your involvement and keeping everyone up to date with your wonderful hosting of the Picture You in Agriculture Facebook page during the week of Showgirl Finals. Horticulture YFC Tayla Field was featured on the Career Harvest website with an article on careers in horticulture and all of the opportunities that have been provided to her, read more here. Shoutout to James Bidstrup for a mention at the evokeAG conference. The importance of sharing the amazing story that is Ag isn’t lost at all on the wider community it seems! Thanks so much. And what do NASA and Australian Agriculture have in common? YFC Rebecca Thistlewaite has featured on the Graincorp podcasts to discuss how research coming from NASA is helping plant breeders and scientists to breed hardier crops. Take a listen here. Expat and YFC Laura Phelps has been promoted in her role in Brexit to the Head of EU-Exit at Food Standards Agency. Congratulations Laura on this amazing promotion, we are looking forward to seeing what you can achieve.